A friend of mine has been in Spain, checking out all the sites. Well when I heard there was a Guggenheim Museum in Bilbao, Spain, I had to learn more. 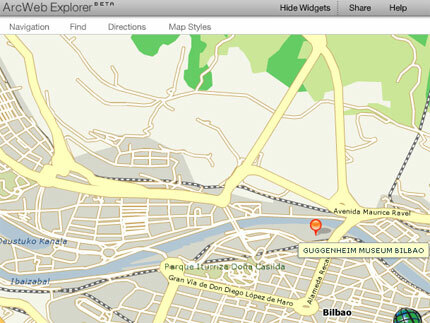 Well Google did get me to their website, but that didn’t help me at all because I had no idea where Bilbao was. My first thought was to put the address in Google Maps, but I got a weird “Sorry we don’t have maps at this zoom level” for Spain (I guess they don’t have as good world coverage as I thought). Anyway, the same problem occurred with Live Local (aka Virtual Earth). I didn’t have Google Earth on this computer so I was getting really frustrated. Then I though, what about ArcWeb Explorer? I took the address, loaded it into an Excel file and then uploaded that into ArcWeb Explorer. Bingo!